I was working on my Friday post that obviously did NOT happen because of three little sneaking girls and one super handsome quilty guy and their scheming ways that rocked my ENTIRE little world! This all started when Amylouwho was organizing a sewing play date at Becky's ( Sarcastic Quilter) house. The local gals try to get together to sew and mostly chat about sewing and things related to life outside of "Where the heck did you leave your shoes!" and " Did you remember to flush and wash your hands?" ( I am speaking of the kids here and hopefully not the husbands but well...). I was so super excited to go play at Becky's house. I had not had the chance to get up there and check out her sewing room ( which is SUPER AWESOME) or meet her fur babies or any of her people babies either. I was looking forward to my sewing mama escape! Monday of last week I found out the kids had early release. Early release is a code name for parent torture. By the time I drop them both off, I have about one hour to get whatever I can done completed and turn around to start picking them up again. On these days I get very little accomplished and so I debate just dropping them off in my jammies and socks with not even brushing my hair or throwing on a bra to save some time. My sewing mama day was not going to happen. I really hate early release days! I was in my sad place and I heard a loud bang on my door. I ignored it since I was in no mood to say hello to the bug guy or even my favorite Fed Ex delivery person. I just sat click, click, clicking away and the phone rang. I have caller id to weed out those pesky sales calls and I was thrilled to see it was RACHEL! I had not talked to her since Michael left for deployment. I was going to whine to her and then feel much better. She is awesome that way. She said " Hey, what are you doing?" She asked " From home?" She said, " Come to your door..."
" YOU ARE NOT AT MY DOOR!" I pretty much ran down the stairs ( without breaking anything) and opened my door to Rachel standing in the POURING rain with a big smile on her face. " I love you" Is what she said and gave me a big hug! again...WTH and THANK GOD I had decided to put on a bra this morning! Now, Rachel lives in Ohio...I live in VA it is about a six or seven hour drive to my house from hers. I saw that she was off to somewhere on Instagram ( I would have no clue what was going on in the world without Instagram) and asked where she was going. Thinking she was off to teach. She never responded. Amy and Becky were there too and so was Rachel's sweet husband Shane ( Sweetie, you are the BEST!) and my Babylouwho! I was pretty speechless, which never ever happens. Amy came out of the car and I instantly would not speak to her! Could not believe she did not tell me about any of this and then it only got better. I had to ask where Rachel was going and then Amy said the most amazing thing..." She is here to see you!" What! Why the heck would anyone drive all that way to see me? I was confused. Then I had to take a minute to shake off my confusion by getting a snuggle from Babylouwho. I am convinced that Babylouwho was a strategic move on Amy's part so I could not really be mad. 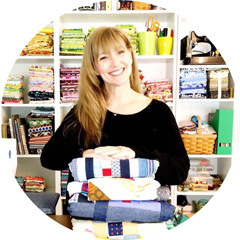 Becky has a mid arm and created the sweetest whimsical quilting with Aurifil 50wt in white to match all the colorful scrappy prints including Heather Ross, Happy Zombie, Robert Kaufman, Tula Pink LADYBUGS, Denyse Schmidt and many many more that were used to brighten my spirits. And Becky did not forget my Magic in the Middle Pellon batting either. Becky thinks of everything ;) It was even bound in my signature red. And the thing that touched my heart the most was the label. 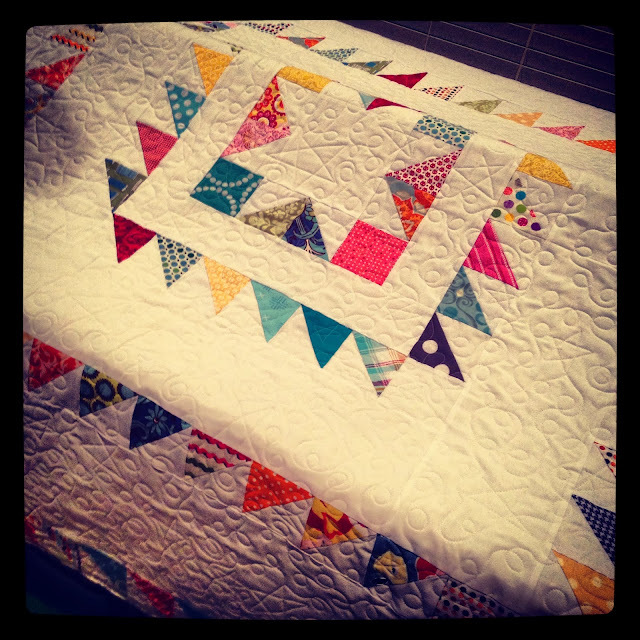 This quilt pattern is named The Deployment Quilt from Rachel's new book. If you have not seen Rachel's new book, you need to RIGHT NOW! 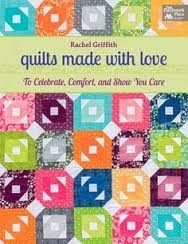 It is called Quilts Made with Love and is published by Martingale. 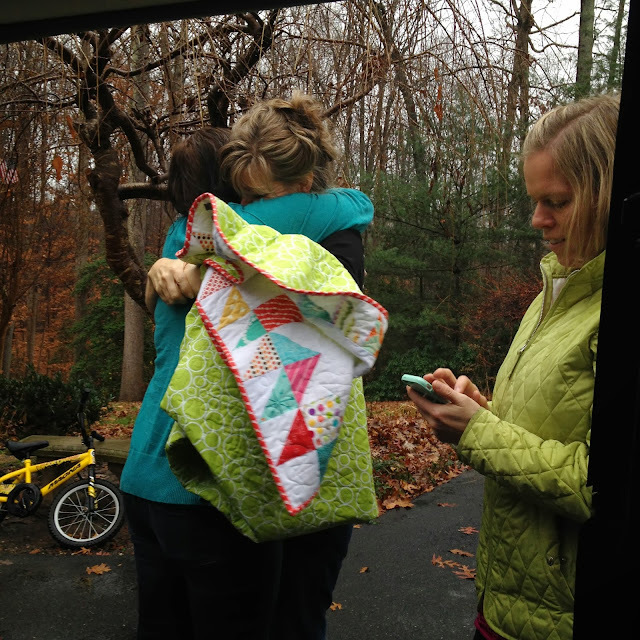 It is filed with quilts to make for situations of celebration or times when people you love or sometimes people you do not even know need the comfort of a quilt. The patterns are clearly written, easy to follow and these are quilts you will have fun making and be proud to give. You can believe me when I tell you that this girl believes in these quilts, in the love that they bring...and I can testify that is is 100% right! Was this to be the end of it...OH NO!!!! After I was able to get my mouth to close and pick up the kids I hauled my troops up to Becky's house and we had another visitor...JOHN Q. ADAMS ( the man I lovingly refer to as Grizzly) ...WHAT THE WHAT!?! Best hugger ever...just sayin!!!! We spent an amazing evening eating, talking, laughing and we all took turns on Becky's midarm using Aurifil...of course...I love her! Here is John doin his magic! Thank you so much to my dear friends...I LOVE YOU and life just would not be the same without you! Oh what a wonderful crazy surprise for you. Hugs. I must admit, I got rather choked up reading this. What amazing friends you have!!! That is so beautiful. Thank the Lord for amazing friends. I'm happy because you're happy. Thanks for sharing and have a wonderful day. I am reading your sweet story, a little teary-eyed, when suddenly I feel a cold hand sneak up my back. My 2 year old daughter was sitting next to me and wanted see if I was okay and give me a "big hug" I tried to explain that you had gotten a fabric hug. She looked at me, nodding, "yes, a BIG HUG!" I hope you are cheered by your visit and find encouragement in your quilt. That was the best story! It brought tears to my eyes. You have a lovely group of friends, because you are special and deserving. Big hugs to you! I'm calling you this week! YAY! GIANT YAY! Having met two of them in person, I can imagine fabulous hugs! Ha! I'm kinda crazy pleased there's only 1 picture of me. :D We love you sista! Awesome day! I have those no bra days too, actually, I have entirely in my jammies days, and then cringe if I have to open the door to the postie ;o) Good job you went for one then! Real friends are the best!! I'm so happy you have them. Stories like this are the ones that give you hope in humanity. Simple and full of love!! You HAVE amazing friends because you ARE an amazing friend. Miss you bunches and bunches. Big smiles coming at you, my dear! Reminds us all to keep in touch with our friends everywhere. That is just the sweetest thing! I read your post and am now all choked up and teary eyed! :) It's great that there is such friendship in the world! What great friends, and a beautiful quilt! I'm loving that backing too. Good luck with your husband's deployment, I don't know how you manage. I wish him a safe return. Wow! This was a wonderful story, sniff, sniff. Here I was feeling a little sorry for myself because my husband will be out of town working this month and your husband is gone for quite a while. I'm glad you have such good and caring friends. That's a beautiful quilt, too. Wow! What a great surprise! It so wonderful to have friends like that! Hello!!!! This is a most awesome (but typical of quilty friends...yes??????) post!!! I am hear because of Teje's post/link to you and I'm so thankful for it!!!! My prayer for you all is blessings to you and your loved ones (deployed) and a huge thank-you for all that is being sacrificed for us. 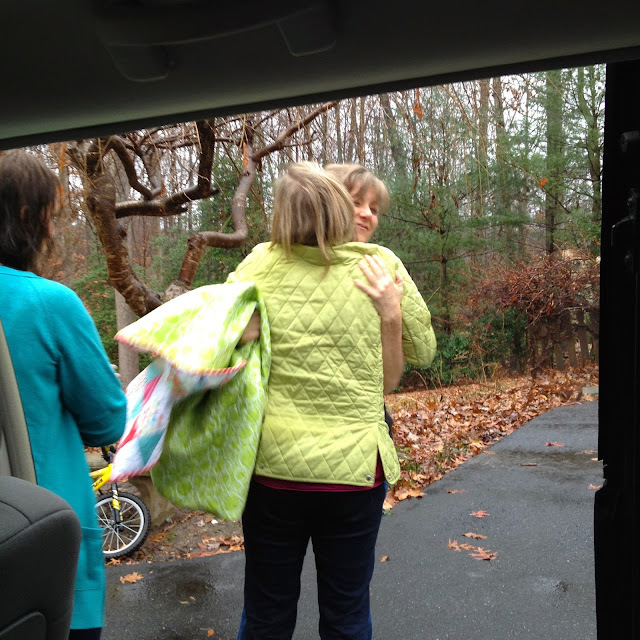 From one quilty/bloggy friend to another......warm hugs!!!! So, so wonderful!!! You're blessed with awesome friends! Such a beautiful quilt that I know you will forever treasure. Vysoce kvalitní holandská značka Bye Bra vznikla v roce 2011. Během dvou let od svého vzniku tento produkt pronikl do více než sta obchodů a modních butiků po celé Evropě. Díky své jedinečné kvalitě je Bye Bra dle našeho názoru mnohem lepší kvality než produkty dovezené z Číny. Nenechte se nutit do nákupu takových produktů, mohou totiž zanechat jizvy a červené skvrny. Bye Bra produkt je testován firmou SGS na bezpečnost pokožky a klasifikován jako ‚neškodný‘ v dermatologických testech. Bye Bra video zřetelně vysvětluje, jak produkt funguje.